Not all pregnancies end with a healthy baby. If you have suffered the loss of a pregnancy there are people trained to help you. You may also find the following resources helpful. 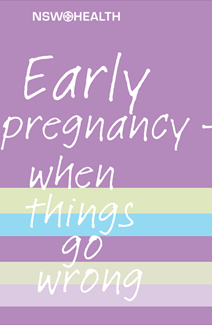 NSW Health has created this brochure in several languages explaining early pregnancy loss. SANDS is an independent organisation that provides support for a newborn death, stillbirth and miscarriage. Bears of Hope provides grief support and care for families who experience the loss of their baby.